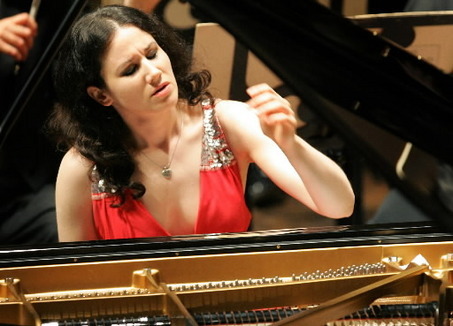 Martina Filjak of Croatia, who performed Rachmaninoff's Piano Concerto No. 2, won the 2009 Cleveland International Piano Competition. Two weeks of intense musical rivalry came to an end last night when jurors in the 2009 Cleveland International Piano Competition crowned Martina Filjak, 30, of Croatia, winner of the 18th biennial contest. While the last few notes of Brahms' Piano Concerto No. 1 were still echoing through Severance Hall, following the fourth final-round contestant's performance with the Cleveland Orchestra, Karen Knowlton, executive director of the competition, announced the results. Behind Filjak in second place was Dmitri Levkovich, 30, a Canadian native of Ukraine; William Youn, 26, of Korea, in third; and in fourth place, Evgeny Brakhman, 28, of Russia. Filjak is now the fifth woman to win the Cleveland Competition, which this year encompassed 32 pianists from 14 countries. As champion, she claims an award package including $50,000, a recital at Carnegie Hall, two years of artist management, and a string of concert appearances worth an estimated $100,000. Second, third, and fourth-place winners take home prizes of $50,000, $25,000 and $10,000, respectively. Competition may be over, but one important event remains: the winners recital. Sunday at 3 p.m., the four finalists will perform selections from their competition programs in a special concert at Severance Hall. Here, too, will be announced the winners of eight smaller prizes acknowledging distinguished performances of special repertoire as well as the opinions of the junior jury and the audience, which voted Saturday by ballot. Tickets, $15. Call 216-231-1111 for information.